After 8 years in the trading industry I was ready for a change. I enrolled in Startup Institute’s inaugural Chicago class with the goal of completely transitioning careers. In addition to the technical marketing skills and networking, the curriculum covered the ever so hard to define idea of startup culture. Prior to SI I probably would have described startup culture with the same surface level view lots of people do - nerf guns, poker tables in conference rooms, and people on mini-scooters. Not terribly interested in these things, I did not expect to get a lot out of this portion of class, but was pleasantly surprised when Managing Director Jason Henrichs started ranting about how these things do not define culture. I caught up with Jason recently to revisit his views on startup culture and discuss how we used a Killerspin Ping Pong Table to help support a collaborative culture within our SI class. Jason, you spoke passionately at Startup Institute that culture is not about ping pong tables, kegerators, and nerf guns, yet we saw you having a blast on the ping-pong table from our partner Killerspin. I’m busted. I do enjoy ping-pong, draft iced coffee, wearing witty t-shirts to work and many of the other “perks” of working at a startup. My frustration is that many startups mistake these for culture when in reality they can be a tool that creates culture. They should be a means to an end, but many startups throw together the latest hip trends found on Quora, call it culture and then wonder why that culture doesn’t seem to be a competitive advantage for them. If this isn’t an effective way to create culture, how do you go about it? It starts with some serious reflection on the company’s mission and values. Why does the company exist? What does it value that distinguishes it from any other. Netflix and Valve both published great guidebooks to their culture that continue to make their way around the interwebs. These are great examples for others to follow, but each startup must create its own authentic reason for being. These values will be the building blocks of hiring, firing and coaching. They should transcend stage of company and the multitude product pivots that are inevitable. So where does the ping pong table come in? Culture can’t be handed down by PowerPoint or laminated plaques adorning the walls. Culture is created (or destroyed) by every action the team takes. It requires a level of intentionality and persistence. If the company values cross functional collaboration, the ping pong table should emulate that by having tournaments or challenges that bring together people that normally don’t interact. If the company values work hard / play hard, the table might double as a meeting table by day and only turn into an arena of mortal combat after 6PM. A company with the value of teamwork might put more emphasis on doubles. Killerspin donated a table to SI about half way through our class. I felt like that was a point where I started interacting with people from other tracks more frequently. Whether it was playing or just hanging out around the table while others played, it seemed more people took breaks from their work and were able to get to know their classmates more. Does this fit with the Startup Institute culture? Any new plans for the table as you gear up for the next class? In addition to the continued dominance of the Startup Institute team, we plan to use the table as a living example of culture building do’s and don’ts. Brian Cuttica is the VP of Business Development at Purchasing Platform, an online marketplace that brings savings and efficiency to the real estate industry. He graduated from the Technical Marketing Track with the Fall ’13 class of Startup Institute. Jason Henrichs is the Managing Director of Startup Institute, the #1 career accelerator, helping individuals gain the skills, mindset, and network to succeed in jobs at startups. We cultivate talent for high-growth companies. 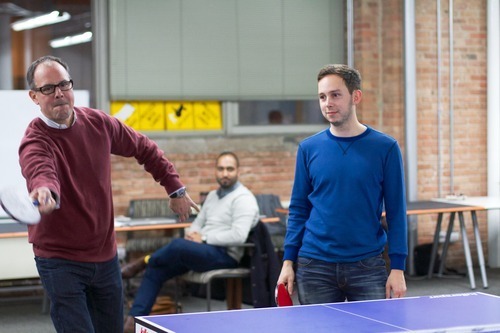 Killerspin, headquartered in Chicago and the U.S. leader in table tennis equipment and engagement, strongly believes in table tennis as a cultural must for all innovative organizations and has created an initiative they call “UnPlug N Play” – encouraging organizations to adopt the interactive game. As a part of “UnPlug N Play”, Killerspin is offering discounted corporate packages including company branded tables, rackets and balls. The idea is to get a racket in the hands of every employee, making them all – from intern to CEO, regardless of race, gender or age – feel part of the culture. Killerspin has witnessed extraordinary benefits of incorporating table tennis into the workplace and strives to make table tennis the go-to collaboration channel for startups and forward-thinking companies around the world.